Since starting my SAHD series I’ve received loads of positive feedback, in the form of direct image views on Flickr, and being approached by clients and families to photograph their own “Extreme” family portrait. I’m grateful for all the attention, it certainly helps boost my ego on these dark winter days. I took a break from producing an overly complex image for this one. The more images I have to stitch together, side by side, the more margin for error there is in the final product. I’ve mentioned this before, but I’m doing these WHILE taking care of my kids, so processing is an interesting endeavor whilst holding a one-year-old (of course I don’t work this way on my clients images). So this photograph is a simple single image composite, layered and blended. Yes, even the element was a unique exposure, sans baby, I had to drop the shutter speed to 1/10th of a second and turned off the strobes to get the flame to register on the camera. I lit this simply, maybe harshly, by using only Canon strobes, leaving my bigger Elinchrom Quadra out. Sometimes it’s just faster to work with small lights. If you have enough, they’ll do the job asked of them. I’d like to mention, new to me, Canon’s flash control menu on the 7D (is it in any other bodies?) is amazing, and gave me full manual control over a single master flash (camera left) and two slaves; a 430ex CTO gel’d behind the pot to simulate the overhead light(not triggered in the photo below), and a 580exII with a sto fen diffuser at camera right to fill in the shadows and even out the scene. With the flash control menu I was able to dial in the numbers all from the safety of behind my camera, allowing me to work quickly and accurately. Of course Nikon shooters have had a similar option for many, many years – small victories I guess. As you can see, I used a Manfrotto magic Arm to hold the camera in place. My tripod wouldn’t fit in the area I wanted to compose the frame, but this thing clamped to the island perfectly. I don’t use it all the time, but it is super handy when needed. there’s two kinds available, I have the kit version, but I hear if you buy it on it’s own there’s an easier to use tension wheel instead of the lever like I have. You can also see this image bigger from my Flickr page by clicking on the magnifying glass. Posted on Thursday, January 13th, 2011 at 10:30 am. Filed under: Extreme Family, Portraits Tags: BTS, Composite, Extreme Family, Justin Van Leeuwen, JVLphoto, JVLphotography, Lastolite, Ottawa, Speedlights, Stay At Home Dad	RSS 2.0 feed. Does your wife know what you're doing to the kids while shes away? Thanks for sharing your setups@! 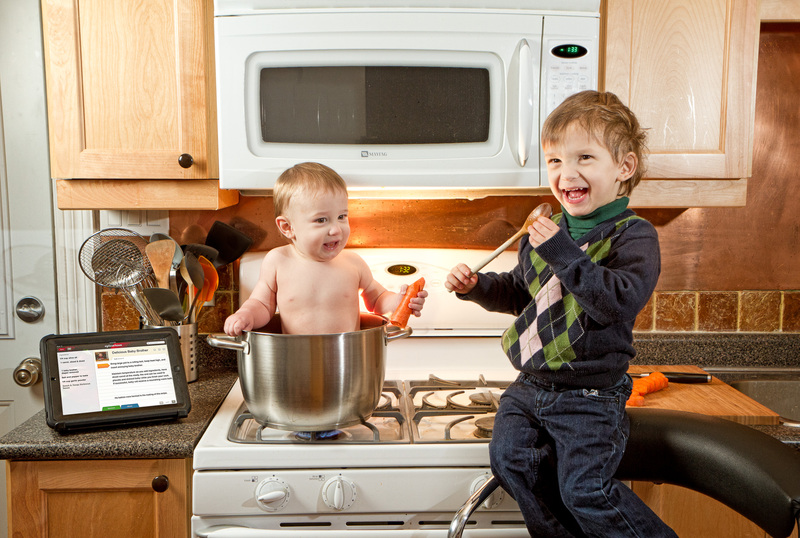 I just laughed so hard at the baby in the pot that two of my co-workers came to see what was going on. Of course, your images are already front and centre in my cube so I just told them it was you again. GREAT news on the referrals. You could have a whole side business of creating these family composite shots. I love it. Justin, I think I've got to add you to my daily morning web read. You really are doing great things. I shoot a 7D also and absolutely LOVE the wireless flash control, especially when you get a flash 8-9 feet in the air…easy to control it. I am curious though, when does baby brother get his "revenge"?